In the heavy winds of Temecula, Surf White opened the 2007 summer season at the Southwest Summer Classic with three wins and a close loss in the finals to the State champions. On Saturday, Surf White started strong, defeating SC Bayern 3-1 and PQ Premier Red 1-0. On Sunday, Surf White completed the sweep of Group A, finishing first and advancing to the finals. Against West Coast FC, Surf conceded a goal in the first half and could not equalize, despite a strong effort to close the match. A year after winning the Albion Cup, Surf White successfully defended their title, defeated Paris St. Germain FC 1-0 on Monday. While not as convincing as their win during play, their second win over PSG FC completed a tournament, where Surf won five games without any losses and outscored their opponents 21 to one. In the final, PSG FC made the smaller field at Robb Field look even smaller, pressuing Surf all over the field. PSG's pressure resulted in a few early chances, but Surf created most of the chances in a scoreless first half. In the second half, Surf continued to create chances, but were unable to find the back of the net. Midway through the second half, Tommy tried to get to a through-ball, while the PSG defender attempted to screen the pass long enough to allow the ball to reach the PSG goalkeeper. Tommy's persistence paid off, as the defender was adjudged to have fouled Tommy in the penalty box. Tyler converted the penalty to give Surf the only goal they would need to claim the trophy. In goal, Mitchell kept a clean sheet, including a sprawling save to his left to preserve Surf's win. In the semifinal on Sunday afternoon, Surf would play PSG's other team, PSG Red, for the second time. Unlike the first match, Surf would dominate from the start, cruising to a 6-0 victory. On Sunday morning, Surf would make a quick start, scoring within the first two minutes on picture-perfect ball movement. Justin got free on the left wing and crossed the ball perfectly to Tommy, for the volley finish. Surf would score three more times before halftime, completely dominating PSG FC. PSG would manage only one shot, on a corner kick. Unfortunately, the scored, the only goal Surf would allow all tournament. On Saturday, Surf would dominate both games but find scoring to be challenging in the first halves. By the second half of each game, Surf's pressure would pay off, stretching tight scorelines to a 3-0 win over PSG Red in the afternoon and a 5-0 win against Encinitas Express in the morning. Surf White fell to FC Barcelona Blue in the NHB Cup finals on Monday afternoon. The match capped an incredibly busy and event-filled weekend of soccer for the team. Playing their sixth match over the three-day weekend, Surf continued to improve the quality of its play and inch closer to defeating the State Cup finals, but in the end, fell just short of getting the win and taking the NHB Cup title. Playing their third match against Barca Blue in as many months, Surf would again take a lead in the first half. Erik scored his second goal in as many days from long distance, lofting the free kick from 30+ yards over the goalkeeper's outstretched arms and into the far side of the net. Barca Blue would come back to tie before halftime, but unlike their previous matches, Surf would nose ahead again in the second half. Chase powered a shot in the near corner to give Surf the advantage halfway through the second half. Barca Blue showed the heart of a champion, however, finding a way back into the match. Although their forward appeared to be in an offside position, the flag stayed down and the Barca attacker would equalize the match in the last 10 minutes of regulation. Surf held off Barca’s attack near the end of regulation to force a 20-minute overtime period. In overtime, Surf White would create several great scoring opportunities, but the Barca keeper was up for stopping the ones on target. Near the end of overtime, Surf almost got the game winner as Max created a great opportunity getting around the Barca defense. However, immediately after their best chance, Barca counter-attacked and created a 3-on-2 advantage that left Surf scrambling unsuccessfully to maintain the tie. Despite a few calls for penalties in the overtime, Surf would be unable to get the equalizer and would have to settle on being NHB Cup Finalists, a very good result in an excellent tournament. Earlier in the morning, Surf edged by FC Barcelona 1-0. Surf maintained clear advantage through long stretches in this match. While FC Barcelona was dangerous in counter-attack, Surf White held possession and territorial advantage for most of the match and were unlucky not to extend its advantage. In the quarterfinals on Sunday afternoon, Surf White would face Stampede FC. Unlike in group play, where Surf dominated but came away with only a win and a tie in three matches, Surf White were dominated for long stretches but were still able to defeat Stampede 1-0 in the quarterfinals to earn the right to advance to the semifinals. In group play, Surf White started with an excellent effort against I.E. Strikers. Despite the effort, however, mistakes in each half allowed Strikers to score twice, and although Surf created many chances, they could not get the ball into the net and fell 2-0. In their second match on Saturday, Surf bounced back to take a 2-0 lead over Las Vegas Premier. A late goal by LV Premier made for an anxious last few minutes of the match, but Surf hung on to get the victory. On Sunday, needing a win to advance, Surf White scored in the first half to take the lead. Brian broke the defense down, and crossed the ball to a streaking Tommy, who headed the ball home. Another mistake, however, allowed Santa Clara Sporting to tie the match in the middle of the second half. Fortunately, Strikers defeated Las Vegas later that morning, allowing Surf to advance to the quarterfinals. In a renewal of their engaging series of matches from last season, Surf reversed the trend and convincingly downed Aztecs 2-0. Last season, while each match was closely contended last season, Surf managed only one victory against four one-goal defeats. On Saturday, Surf White traveled to South San Diego to start a new trend. On an uneven field, Surf White started quickly, creating several clear opportunities throughout the first 20 minutes of the match. Unfortunately, they were unable to convert these changes into goals. Towards the end of the first half, Aztecs gained some control of the match and started to create opportunities of their own, including a number of corner kicks just before halftime. Both defenses, however, were winners in the first half, keeping the match scoreless at the half. As the second half began, Surf immediately took control on the scoreboard. Within the first two minutes of the half, Surf took the lead. Tyler's well-placed through-ball freed Brian beyond the Aztecs defense, and Brian converted with a well-placed shot to give Surf the advantage. Midway through the second half, Surf's continued pressure was rewarded when Tommy's hard work along the end line resulted in a cross that Zack converted to double Surf's lead. The second goal took the a measure of the fight out of the Aztecs and allowed Surf to confidently control play for the remainder of the match. While Surf's lack of matches keep it from the top of the Premier table, it remains unbeaten in its two matches and has yet to conceded a goal in either match. 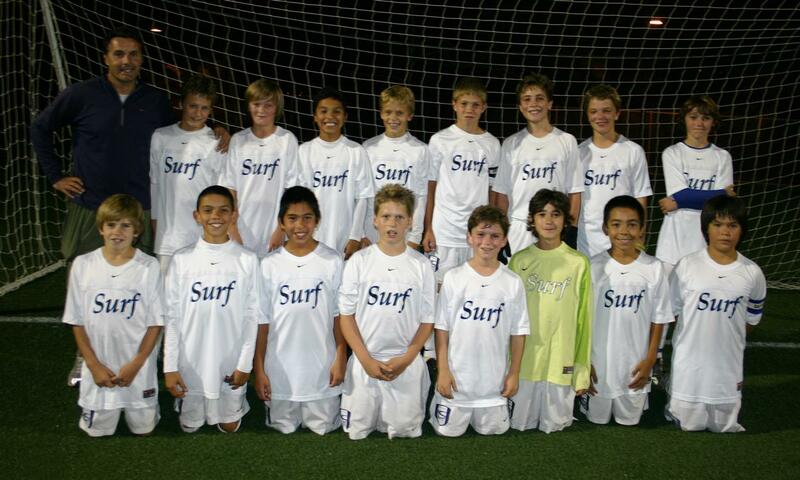 By defeating Hotspurs USA on Tuesday evening 5-0, Surf White captured their third consecutive Presidio League title. Two years ago, Surf White captured the AA-A title to earn promotion to AAA. 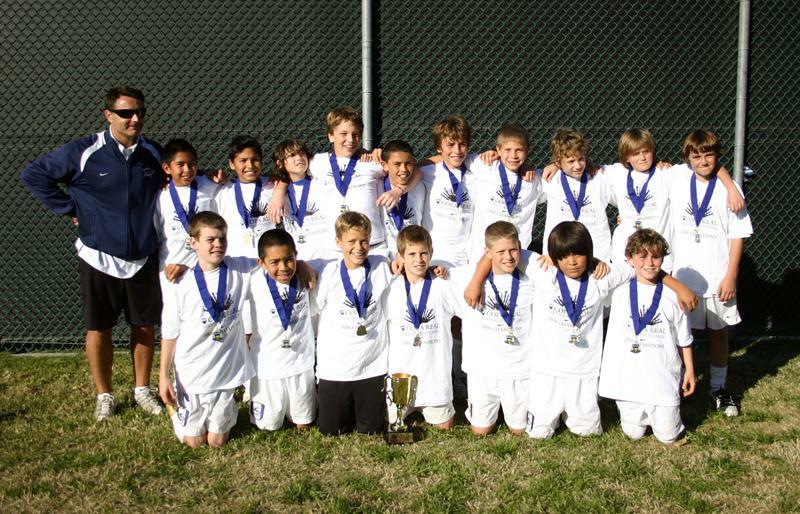 Last season, Surf White captured the AAA title, Presidio's top division at BU-11. 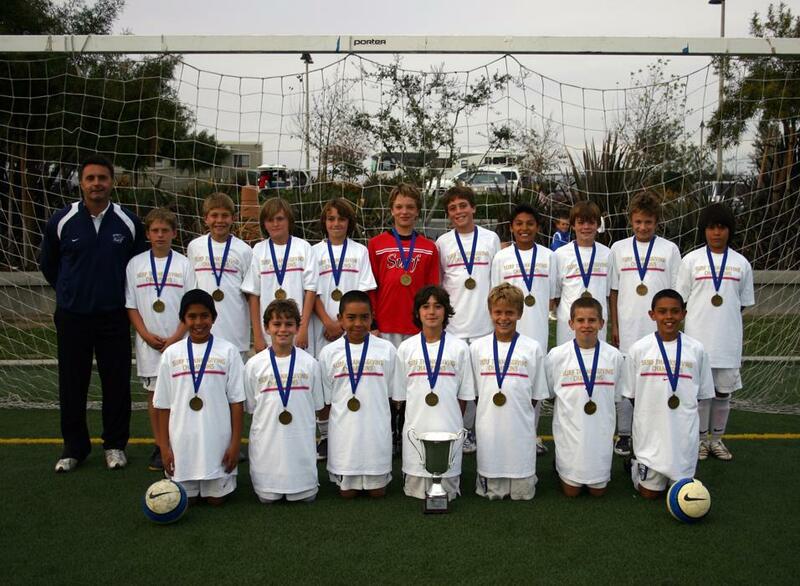 This season, their first at the Premier level, Surf White defended their crown as the top team in San Diego County. On Saturday afternoon, Surf White completed their league season without a loss, coming back from 1-0 down to defeat Rancho Santa Fe 2-1. By winning their final game, Surf finished the season with 11 wins and 3 draws, good for 36 points and a 6 point advantage of second-place Aztecs Premier. On Sunday, Surf White captured the first Surf Thanksgiving Tournament, defeating West Coast United for the second time 2-1 in overtime. In their first meeting, during crossover group play, Surf and West Coast played a tight first half before Surf broke loose and won 6-0. In the rematch, it would not be that easy. West Coast came out with a great effort and pressured Surf all over the field. A mistake in the back freed the West Coast attacker, and he scored to give West Coast the lead. After the goal, Surf picked up the intensity but still trailed at the half 1-0. In the second half, Surf pressed for the equalizer, and Brian would deliver after Erik's free kick was barely saved by the West Coast keeper. Although they created several chances, Surf was unable to break the tie before the end of the regulation. In golden goal overtime, Surf created a chance and received a bit of luck to get the win. Kevin ran down the right side and attempted a cross, only to find the back of the West Coast defender, deflecting the ball over the wrong-footed keeper and into the far side of the goal. In the semifinal earlier in the morning, Surf faced Presidio rival PQ Premier. Like West Coast later than afternoon, PQ Premier gave Surf trouble the entire first half. Although they created few chances, they limited Surf's chances as well. In the second half, Surf played some of the most attractive soccer of the season, controlling play with quick passes and movement. Their great play created chances as well. Nick crossing for Brian to score the go-ahead goal, and Max crossing to Tommy, who chested the ball into the goal to give Surf their 2-0 victory. Surf White won the Copa Real championship last weekend on the strength of dominating possession, solid team play, and a stingy defense. After strggling for large parts of their game in the morning, Surf faced Santa Barbara FC for a second time in the final; in their rematch, Surf would take the early lead, dominate possession throughout the first half, and cruise to a 6-0 win. In earlier group play, Surf opened the tournament on Saturday against Santa Monica United. Although the final score was 3-0, Surf White completely dominated possession and had many more scoring opportunities. In the afternoon match against Real So Cal, Surf started clicking, scoring early and often, en route to a 7-0 victory. In their final group match, Surf faced Santa Barabara FC for the first time and drew 0-0. Scoring leaders for the weekend included Kevin nwith 5 goals, Tommy with 4 goals, and Corey with 3 goals. The defense earns kudos for keeping "clean sheet" for the entire tournament – no goals allowed in four matches! In the finals of the Temecula Valley Shootout, Surf White fell 4-2 in penalty kicks to Lightning Soccer Club's BU-13 Red team. In a match featuring heavy rain throughout, Surf showed well against their opponents, a BU-13 AAA team. Lightning had been dominant in group play, outscoring their opponents 22-0 in three group matches, but it was Surf that took the first-half advantage mid-way through the first half, when Eric's free kick was deflected pass the wrong-footed keeper. Surf marginally outplayed their older opponents until mid-way through the second half, when Lightning began use their size and endurance to their advantage. Surf continued to hold their narrow advantage until some questionable sportsmanship led to Lightning's advantage. With Justin down following a tough challenge, Surf tried to put the ball out of play; Lightning kept the ball in and sent the ball back into the penalty box. Some shaky defense then led to an open man in front of the goal, and Lightning converted to tie the score. Within two minutes, Lightning took the lead. A though-ball brought Louie out of the goal, but Lightning's quick forward got there first. The ensuing scramble left the goal open, and Lightning was able to get the shot off and into the net to take the advantage. Surf looked unlikely to equalize late until a late free kick opportunity gave Surf hope. Tyler took the kick beautifully, over the keeper's arms and into the far corner of the net. In penalty kicks, however, Surf fell short. Lightning was perfect through four kicks, and Surf's two misses sealed their fate as finalists. Against older teams, however, Surf showed very well, allowing only the two goals in the finals, while scoring nine. Goal scorers included Tommy and Tyler, with two each, as well as single goals by Brian, Corey, Danny, Nick, and Eric. Surf White started their National Cup campaign this past weekend, winning twice against group opponents South Bay Soccer Club and FC Barcelona Red. Despite six points from their first two matches, Surf has not secured a place in the round of sixteen; however, a tie on Saturday against ISC Strikers will win the group and a loss by two or fewer goals will secure at least second place. 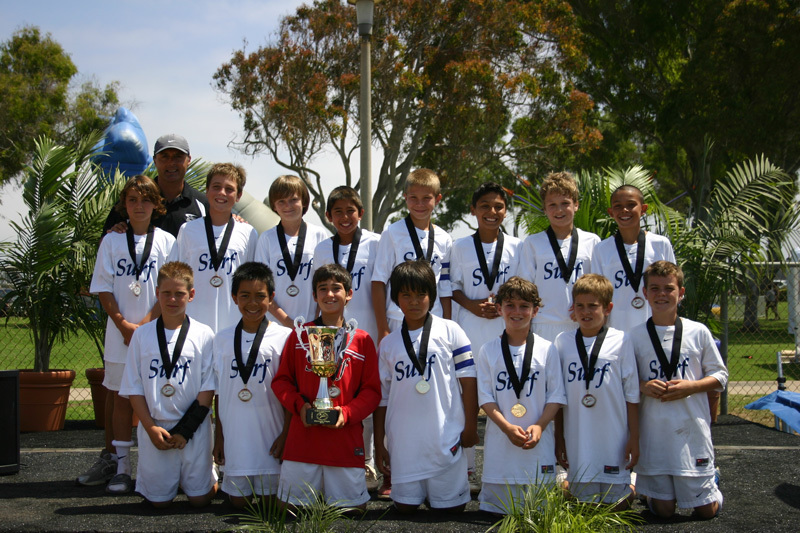 In their opening match on Saturday, Surf White faced South Bay SC, who finished tied for fourth in Coast Soccer League's Silver Elite North. Surf started their match quickly, and controlled the first half complete with excellent possession, passing, and numerous scoring chances. They were rewarded with two quick goals in the first 12 minutes of the match. Another before the end of the half and three more goals in the second led to a 6-0 rout of South Bay. Tommy's flick-in from Brian's cross gave him a hat trick for the match, while Brian added two more and Daniel added the sixth. On Sunday, Surf White would face a much tougher opponent, FC Barcelona Red, champions of Coast Soccer League's Silver East league, Coast League cup quarterfinalists, and last year's State Cup quarterfinalist. Surf spent the first five minutes reacting to the speed and size of Barca Red, but gradually raised their game and started to control the match. Their control would be rewarded with two goals in the first twenty minutes, the second coming after some acrobatics from Max and a sharp header by Corey. Surf appeared in complete control, but an amazing 30+ yard shot over Louie and into the "upper V" just a few minutes later would keep Barca in the match. The second half opened with a quick equalizer for Barca Red; Surf had trouble clearing the ball and allowed a well-placed shot into the far side of the net. Surf had their work cut out for them, but they reacted well, creating numerous chances throughout the second half. Unfortunately, luck did not appear on their side; two shorts against the post and another off the bar would prevent Surf from getting back in front. Controversy erupted late, as Kevin was brought down from behind without a card and Nico was dismissed without warning from the referee. Brian saved the match for Surf with only five minutes to play with a wonderful dribbling display, maneuvering through four Barca defenders and finishing the attack over the Barca goalkeeper. Surf limited Barcelona Red to only three shots the entire match, but had to dig deep to get the third goal and all three points. Corey scored twice and Brian provided the game winner. On Saturday, Surf faces ISC Strikers, looking for revenge for their match early in the season. A win or tie will win the group for Surf, while a narrow loss of fewer than three goals will guarantee advancing into the round of sixteen. Strong pressure and numerous goalscoring chances finally paid off for Surf White late in the game when Tyler's free kick found the side netting. Surf finally had the advantage for which they had been playing for nearly sixty minutes. Five minutes later, three whistles was the signal that Surf had advances to the Cal-South National Cup Semifinals. Surf will face Stampede SC on Sunday morning for a trip to the finals. It had been a frustrating game for Surf. Despite constant pressure, they had been unable to create many goalscoring chances. A few half-chances were left untaken, and the few chances they did have were either off-target or well-defended. Laguna Niguel relied upon their physical style of play and keeping most of their team behind the ball and inside the box, making it difficult for Surf to open the field up for goalscoring chances. In the end, however, their fourth free kick in the attacking third finally yielded the winning goal and a trip back to Capistrano on Sunday morning. Surf White defeated RSF Attack Green 1-0 on Sunday to run their National Cup record to 4-0 and advance to the quarterfinals. Eric's free kick provided the difference in a tightly fought match played in cold, windy, and somewhat wet conditions. Surf travel to Rancho Capistrano to face Laguna Niguel SC on Saturday at 12:00pm. Aided by the wind and a slight incline, RSF Attack had its moments in the first half. Relying upon the counter-attack, Attack was able to create a few chances, including a looping shot that appeared destined to slip into the goal just underneath the crossbar until Lucas reached high to catch the ball and a hard shot that Lucas did well to read and hold onto above his head. When the teams switched sides, Surf began to take control of the match. Unable to get the ball up to its forwards, Surf enjoyed the vast majority of possession. Unfortunately, RSF's defensive posture made it difficult to get clear chances on goal. Finally, Eric rescued Surf with a well-struck free kick that was always going to find the back of the net. On Saturday, Surf eased by ISC Strikers 1-0 to win Group E and advance into the round of 16. As with their first two matches, Surf dominated possession and created many scoring opportunities. Unfortunately, those chances either missed the target or were well-saved. Strikers created only a handful of chances but stayed level until midway through the second half, with Brian dribbled free up the middle of the field and unleashed a terrific shot from over 20 yards out. 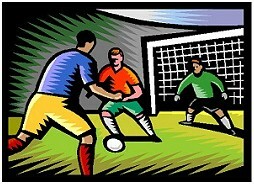 The shot was too high for the keeper to touch but found its way underneath the crossbar and into the back of the net. Additional chances would follow, but the game would end 1-0, which suited Surf fine on this day. Surf White finished their 2007-2008 season with a 1-0 overtime loss to Stampede SC on Sunday morning. Surf finishes the year with 38 wins and 5 ties against only 8 losses. The season featured wins against top teams, including Aztecs FC Premier, Stampede SC, FC Barcelona, as well as well-fought, overtime losses against both FC Barcelona Blue and Stampede SC. The boys have developed a lot in the past season. On Sunday, Surf would create chances early, but lacked the final touch necessary to beat Stampede SC's goalkeeper. Most of the match would be played in the midfield, with both teams having the better of play at times. On the whole, it was a very even match, and it's not surprising that it went into overtime tied 0-0. In overtime, Surf would suffer a breakdown and allow one of the Stampede forwards to get free. While it looked like Surf was able to get back and eliminate the danger, the ball remained free and Stampede scored the go-ahead goal. For the remainder of overtime, Surf applied pressure and created a chances, but they were either well-defended or Surf was unable to put the right touch on the ball to get the equalizer. In their second year under coach Mike Nicholson, Surf White continued its development and became one of the top sides in Cal-South. For the second straight season, Surf White won the top level of the Presidio League. This season, they finished the league without a loss, six points ahead of second-place Aztecs while outscoring its opponents 41 to 6. Outside of its league success, Surf White's top accomplishments were advancing to the semifinals of National Cup before losing narrowly in overtime to Stampede SC 0-1 and advancing to the finals of NHB Cup before losing narrowly in overtime to FC Barcelona Blue 2-3. Both matches (and tournaments) showed how far Surf White have advanced this season and in both matches, Surf had opportunities to win. Over the entire season, they won 38 matches, tied 5, and lost only 8 matches. Of those eight losses, six were West Coast FC (0-1; defending and future Cal-South and Coast Gold champions), NJSA Celtic (0-2; ranked #1 in the nation at the time), FC Barcelona Blue (three times: 1-3, 1-3, 2-3 OT; 2nd in Coast Gold), and Stampede SC (0-1 OT; State finalist, 3rd in Coast Gold). Over the entire season, Surf White outscored its opponents 130 to 34.